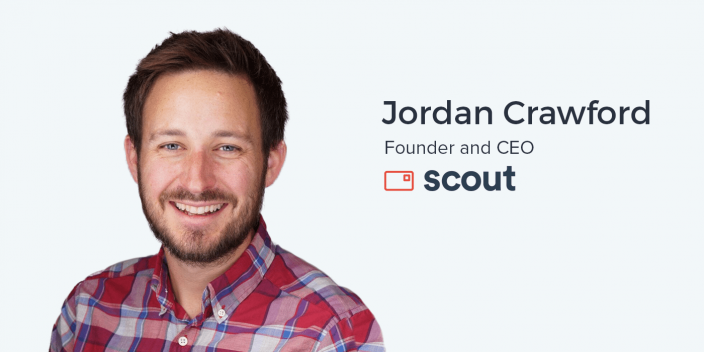 Jordan Crawford is a Co-Founder and CEO of Scout, a company creating the next generation of postcard marketing by bringing all the benefits of digital advertising, targeting, and tracking to this previously analog channel. He also runs Postcard Marketing Pros, a Facebook group for direct mail marketers. Scout launched out of Rocketship Labs in San Francisco. The product allows business owners and marketers to personalize postcards with a SaaS-style in-browser design tool and optimize their direct mail campaigns with built-in analytics. After years of competing against the digital space, analog marketing channels including billboards, print ads, and most notably, postcards have an opportunity to resurface as powerful vehicles for brand awareness and acquisition. Even though many marketers were still using these channels, they were frequently doing so based on anecdotal evidence of success without any data to back up their decisions. The digitizing of these channels will open up many new opportunities for marketers to reach new audiences in novel and potentially high converting ways. Ideally, you should be able to describe your product as simply and succinctly as possible. In fact, Jordan recommends being able describe it in a way someone understands within 2 to 5 seconds. Surprisingly, even with the limited amount of real estate for copy and creative assets on postcards, as well as AdWords and Facebook advertising, it can be tempting to provide as much information as possible. Instead focus on the content that is most relevant to create that conversion. The marketing trends of the “Madmen Days” when breaking through the noise relied on mass marketing media buying and long term campaigns could someday make a comeback. In fact, the parts of seemingly outdated marketing methodologies, and the channels themselves, might become more powerful than they were before. Before digital advertising was accessible to a massive audience, Postcard marketing was one of many awareness and acquisition channels that companies defaulted to. Now, it has the potential to be far more powerful as early adopters take advantage of a channel made digital for the very first time. Ander: I’ve said a few times when I’ve done these podcast interviews before, sometimes it’s a great excuse to talk to someone, to see somebody who I haven’t seen in a very long time. And I’m sitting down right now with one of those people: the founder and CEO of Scout, Jordan Crawford. Jordan, thank you so much for sitting down with us today. Ander: So, Scout—what is Scout? I told our audience a little bit about it in the introduction to this interview, but obviously, we would like to hear it from the man who created it himself. Jordan: Sure. Scout is a next-generation postcard marketing system. It’s different in three ways. The first is you can design a postcard in the browser. That means you can copy and paste images. You can add text. Incidentally, you can add variables from your list. So, you want to do things like MailChimp can do where you can insert first names or whatever information you have in the list, you can actually insert that into the design. More importantly, we can do tracking per postcard. We have the ability to generate unique URLs for every single postcard, a phone number per campaign. We can do QR codes or promo codes. Because the URLs and the QR codes are unique to every single card, we know who came and visited your website from that card. We have a dashboard where you can see exactly who came. We have caller IDs for folks that called into the forwarding number that we auto-generate, and we have the ability to do targeting for you, too. If you’re looking for people in San Francisco that like cats that live in a house and are interested in sports, we can find those six to eight people. Jordan: Yeah. We’ve got a list tool that will actually validate every single address with USPS to make sure that you don’t send any postcards that won’t be deliverable. You can actually edit those addresses inside of Scout Studio, and we’ll validate them every time to make sure that you only pay for and you only send postcards that actually will be delivered. Ander: Wow. That’s really cool. So, if I’m understanding all of this correctly, you’re basically taking everything that’s awesome about digital marketing, and you’re bringing that to the analog world. Jordan: Yeah, and you would be surprised how many people send postcards. I got a gentleman who contacted me a couple months ago, who had a $100,000 budget for postcards because they had heard it worked for another person in their space. It was crazy! I’m like, “You don’t have any data on this, and you’re going to run a postcard campaign because you had heard it worked for a competitor!” And I thought, “That’s not the way. You would never do that with Google Adwords or Facebook. Jordan: You’d need to know. With postcards—no one really knows right now. Ander: As marketers, we’re obsessed with data, and I think that that’s one of the reasons that people are so turned off or scared by billboard advertising or postcards. But you’re solving that problem. That’s really cool. Ander: I’ve got to ask—what inspired this? Jordan: Well, interestingly enough, we had a product before this that was instant small business websites. Ander: I think I remember you showing that to me about a year ago. Jordan: Yeah. So, you can instantly generate a website for any small business, any restaurant, and you can see that it works fine on all different devices. We actually did some marketing for that product. It’s really, really hard to reach small businesses, as you probably know, Ander. So we sent a bunch of postcards out, and we were working with an API partner to do that. We launched on Product Hunt. We were the first on Product Hunt. I didn’t send a text message to my friends. I didn’t contact my parents. None of that because I think people were looking for that. In the first three months, we closed more revenue than the last two years of running that business. Jordan: So, we decided that that’s the way to go. Ander: That is awesome. Now, given that you are, again, digitizing something that’s in the analog space what is your marketing philosophy? How has Scout changed that or shaped that as you’ve grown this company? Jordan: Well, one thing I noticed that most marketers (myself included) just do awfully is describe their product. I mean, listen to my 20-minute pitch of Scout! It wasn’t as good as it could have been. But because they know their product so well, they’ve got jargon on it, right? I’ll see some of my customers that will come to me with postcards that have thousands of words on them. I mean, that’s a little bit of an overstatement, but lots and lots of words. This is not your pitch. The purpose of sending a postcard is sort of half sales, half advertising. You just want to get people’s attention. Now, the nice thing is there are not as many postcards in your box as there are emails. channel, but if you don’t describe your product in a concise and interesting way, people aren’t going to interact. I did a live interview the other day with Imperfect Produce. They send you ugly produce. Ander: Yep! I’ve heard of them. Jordan: Their tagline is “Ugly Produce. Delivered.” Perfect. Three words—exactly what their business does. My philosophy is to describe what you do in a way that a customer who knows nothing about your business can understand in 2 to 5 seconds. That’s it. If you can do that, you’re way ahead of the game. Ander: And on a postcard facilitates that with the limited amount of real estate that you actually have. Is that fair to say? Jordan: Surprisingly not. People like to cram more information into the small space instead of the other way around, as you might think that it leads folks to be more concise. People happen to throw more information into the postcard, which defeats the purpose. Ander: People should apply that to post-click landing pages as well. Ander: So, postcard marketing—is that what I’d call it? Ander: I’m a digital marketer. Maybe I work for an agency. Maybe I’m a marketing manager at a larger team or organization. I want to get into postcard marketing. What do I need to be aware of? And what do I need to consider as I’m evaluating if that’s an effective channel for me? Jordan: That’s a good question. The folks you want to target—that’s going to make up a lot of your ROI, right? eCommerce companies, for example, have folks that have dropped out of the cart, right? Jordan: They’ve added stuff to the cart, added their address, and not completed the buy, right? Those are great people to mail because they know your brand, they’re going to see it, and they’re going to respond. My mechanic sent me a postcard the other day that said, “Hey, your car is probably broken. You should contact me.” So, for sure I did because I had a relationship with that person. I would say to start with your list. Think about who can you contact that knows your brand. If you don’t have a list of addresses of folks that know your brand, I would say know who your customers are really well. There are a bunch of different sites, like InfoUSA, where you can buy mailing lists of folks that match your demographics. So, the more you can spend on your list, the better off you will be. The other piece that’s important for folks that are looking to get into postcards is to think about: What is your offer? What is going to get your ideal customer to respond to you? And who are your current customers? Who are your best customers? Surprisingly, a lot of folks that I chat with don’t know the demographics of their customers because, in a digital world, you click some things down, you try different things. But even if you went into Facebook, I would say that you should start there and then target based on the folks that have reacted to your online stuff and pull targeting information that way. Ander: Do you find that a lot of the leads or the customers that you’re talking to are marketers? Or are you talking to a lot of people who do not have a very highly skilled digital marketing background? Jordan: Surprisingly, a lot of the companies that send unlimited amounts of postcards are in nontechnical industries. Jordan: It’s actually kind of bifurcated. There are a bunch of startups that have discovered this. I got sent, by accident, about 40 postcards from Caviar the other day. Ander: Did they have unique promo codes on them? Haha. Jordan: No. So, they were doing something called EDDM, which is “every door direct mail” where you basically give a stack to a post person, and they put it into different boxes. It’s because it’s much, much cheaper than if you send it to individually targeted addresses. Ander: Yeah! That’s actually interesting because any postcard that you get in your mailbox, is pretty much a qualified lead for you guys. Jordan: Yeah, actually, it is kind of funny. I try to get my address out there. Any time a form asks for my address, I’m like, “I’ll enter that thing twice to see if I can get some more leads that way!” I didn’t think about that, but that is true. Ander: You are probably the only person who enjoys entering in their address and giving it away as much as they can! What are some of the unique growth challenges that you have with Scout, because it’s a really different product. I don’t know if you’d call it SaaS, but there’s a SaaS component to it. What are some of the interesting growth challenges that you have? Jordan: Oh, this is a good question. We launched Studio sort of officially two or three weeks ago, and we were sort of operating as a consulting agency ahead of that to validate that there was a product here and that it’s something people wanted. And I haven’t really been able to keep up with the deals, surprisingly. Folks will find me. I’ve written online about how to run a direct mail campaign and how we go about our design process. We’ve got a Facebook group that we’re growing, an active YouTube channel. There are just a handful of places that I’ve tried to spread the word about postcard marketing. Onerent is one of our customers, and they do property management for folks that own property. They can get addresses of those folks. That is their channel. So, I would say that we don’t really have to convince people that postcards are a thing, fortunately, because these people that know really know and know this is a problem. The largest growth challenge is really getting to those folks that are sending 1.0 postcards through a mail house, where they’re going to ask you questions like, “What size paper? What density?” They don’t care about your marketing challenges, right? It’s a printer. They care about printing. It’s talking to those people and saying, “Hey, you can run a postcard marketing campaign and measure the results.” That’s a hard conversation to have because they’re like, “Wait, what do you mean? It’s a print thing. I don’t know how that works.” So, it’s really just getting in touch with people that are not in this new digital space and are sending a lot of mail. Insurance companies will send a bunch of mail—and real estate agents, too. Another thing is having the conversation about price. We’re more expensive, intentionally so, because you can measure and determine what your ROI is. Ander: Yeah, you get what you pay for in that case. I chatted with another gentleman yesterday that only sends 4×6 cards because even though they convert at a much lower rate, the price per conversion is much better. Ander: It’s a lower cost per acquisition. Jordan: Yeah, lower cost per acquisition. There’s all sorts of cool testing that you can do. I think it’s actually a really good time for it because the tools have just started to develop. We couldn’t have built Scout a year ago. The technology wasn’t there. The tools are just starting to become available where modern marketers can use this channel, and use it in the same sort of way they use Facebook ads and understand it if it works for them. Because it’s not overrun, like any great marketing channel, you’ve got a window that if you can take advantage of it, you have the opportunity to convert. Ander: Right. It’s probably underutilized by a lot of people because they haven’t considered the possibility of actually making this work, you know? Jordan: Yeah. I like to tell this story. If you go into DoorDash’s building, the folks that manage their front desk are writing letters to small businesses to get them onto DoorDash. Jordan: Yeah! That type of personalization I think is something else, and it’s clear that they’re just trying to utilize maybe time that is otherwise spent. It just helps them because they’re already paying for that person to be there. You’d be surprised at the folks that are using direct mail. Those larger, sort of mid-sized to larger startups know that it’s an underutilized channel, and you’ll see them send a bunch of postcards. Ander: Now, can you A/B test postcard marketing? Jordan: We actually just sent our first official A/B tested campaign out yesterday, and we were just testing the image. We get most of our images from Unsplash or Pixabay, and those are royalty-free images that you can use. I worked with a founder, and we picked out three or four different image. Because we have a dashboard, we created a couple of campaigns and sent out several thousand postcards, and we’re going to see which image converts better. Then we’ll tweak other design elements as well. Ander: Now, with digital advertising, you could call it the “post-click experience,” but in the postcard marketing world, what are some of the observations that you’ve made of how the experience might be different when someone converts? And by “convert,” I mean when they go to that personalized post-click landing page. Jordan: Postcards have a unique challenge there because it’s like somewhere between direct sales and advertising because generally, I’ll advise people to send three or four postcards in a given month, and I chatted with someone who was doing 1.5 million pieces a month of direct mail. They’ll send five or six pieces to one person in a given month, and they will see them act on the first piece because what they do is they hold on to that card. Three or four more pieces come in, and they throw that in the trash. “I already have that first piece of mail that you sent me, and I’ve been meaning to act on it. Ah, I’ll do it today.” And they’ll go in and enter the code from the first card and convert on that. We’ll also tell you to look at your Google Analytics. We can tell you exactly when the cards arrive, so you can look at your Google Analytics and see who converts. We’re doing an experiment with a company that can actually do address attribution based on cookies, which is crazy! Ander: Are people doing awareness-raising campaigns/just brand awareness with postcard marketing, or is it fairly conversion-focused? We’re working with a customer right now who runs a company, Touchpoint Games—shout-out to Chris! He runs a football pool. So, he’s going to have realtors run football pools for their neighbors. Jordan: So, they can say, “Look, you bet on this thing, and you win a $500 Amazon gift card if you win.” It’s a way for the realtor just to really be engaged with the community. Folks will come in and say, “Oh yeah, I’m going to bet on the Patriots to win,” and they get points. So, it’s mostly for conversions, but there are some examples where it’s just a pure awareness thing, especially when the ROI is really, really high, like you’re selling a house. Ander: If we kind of take a step back from a lot of what we’ve talked about and look at things on a bit of a broader level, I’ve got a theory that I’d love your perspective on. Back in the Mad Men days, let’s say, everyone was super into creating these crazy billboards and expensive TV commercials, and that was really how you broke through the noise. That was how you got the message out there. When digital really started ramping up, a lot of people kind of turned their nose up at magazine ads or anything else analog like that. Ander: And I imagine that happened quite a bit with postcard marketing as well. I’ve always thought that some of these more traditional analog channels are going to start becoming relevant again, and I think that this is a testament to that. So, with all that said, where do you think marketing is generally headed in the future? And, how do you think Scout is going to impacted? Or, how will Scout impact marketing? Jordan: Oh, what a question! I’ll say two things. Jordan: The first is that things are cyclical. So, what happens is people will utilize a channel, it will get overwrought, people won’t respond to it, and then people will forget about it. You can see this in antibiotics, right? It’s like you look at some crazy antibiotics from the 1600s, and it’s like, “Oh, if you rub a cat on yourself, you’ll get cured of scurvy!” And then it’s like, “That’ll never work!” and they try it, and it’s like, “Oh look! You’re cured of scurvy! Why does that work?” It’s because we haven’t used it in a billion years. I think marketing is the same way. People come back to channels that they forgot about, and everyone was so excited to rush on digital. The great recession actually drastically dropped the amount of postage that was sent. Jordan: I think there is a cyclical element. You also asked where Scout and postcard marketing in general, fits into this cycle? Jordan: Well, fortunately for us, it’s a channel that still exists. There are a lot of people that are sending postcards today, as I said, in that 1.0 fashion, sending it out because they always have sent it out, right? There’s a huge opportunity to make that smarter, but all of these new startups and a bunch of large companies that have come about in the last 10 years aren’t doing it and don’t know it’s a channel. postcard marketing are really, really low, and they don’t understand the power of it, which means that that’s an arbitrage opportunity for us to A) charge a bunch of money for it, and B) provide a bunch of value that doesn’t exist today because a lot of the really big spenders in marketing either are using it in an old-school way or aren’t using postcards at all. Ander: Awesome. Well, Jordan, this has been a really interesting conversation, and the technology that you guys are working on with digitizing this analog thing is just so, so cool to me. Thank you so much for coming in here once again. I’ve got one last question for you. How can people find you? How can people find Scout? Jordan: Oh, great! I love to answer that question. Jordan: Yeah, so I am Jordan (J-O-R-D-A-N) at SendWithScout.com. Feel free to email me. I love helping out in so many different ways. I’d love to look at your postcard and provide critique. We run a Facebook group, Facebook.com/PostcardPros and the website is SendWithScout.com. You can sign up for Scout Studio for free. If you’re thinking about postcard marketing, I’d just like to make the offer—send me an email. I just want to help educate folks on the channel and to teach them about it and to provide as much information as I can. I don’t really care if you use Scout. If you think well of me, then that will be payment enough! Jordan: So, thanks so much, Ander. I really appreciate it. Ander: Yeah. Thanks for coming on again. This was awesome.